When I was a boy growing up in Alberta, occasionally my buddies and I would skip school to go fishing at a nearby lake. None of us had any money so our gear consisted of sticks, string and whatever hooks and bait we could scrounge up including table scraps from the previous night's dinner. Back then, fishing was simple. The fish were big, plentiful and relatively easy to catch. We kept and ate virtually everything we caught because there was a seemingly endless supply. Fast forward 50 years and "fishing" has become much more than fun. Whether for sport or commercial, the fishing sector is complex, complicated and sometimes controversial, even within the context of tourism. Because of the nature of TIABC's work, we tend to hear more about the range of issues associated with fishing that include everything from restrictions, closures, dead lakes and depleted stocks, to fish farms, constitutional rights, fisheries management and job losses. Learning about and sorting through these issues while coming up with solutions requires a combination of patience, diligence and and the realization that there are no easy answers or quick fixes that will satisfy all stakeholders. That said, we've waded into the deep end so to speak especially after what has taken place in BC's north the past two years. Resorts, angling guides, suppliers and many other tourism related businesses have taken a huge hit from recent decisions that severely impact their livelihood. The Sport Fishing Institute, BCFROA and others have provided background and positions on the Skeena situation (see previous TIABC newsletter) that our Policy Committee and staff are endeavouring to get their heads around. Suffice it to say, it will take some time for all the reasons I mentioned earlier. In the meantime, as we get up to speed, we are speaking with politicians in both Ottawa and Victoria who not only know about the issues but are in a position of influence and can work to find common ground and solutions for all parties concerned. I don't often look back and long for days gone by. But in this case, I wish I was back in the 60's bragging to my friends about how big and how many fish I caught with a tree branch and rope instead of worrying about whether my own lake has enough fish to satisfy the demand now and in the future. It's a common refrain from everyone associated with the fishing sector and will continue to take the collective effort of those in the tourism industry, multiple levels of government, Indigenous peoples, and other stakeholders to work together to set a path for future generations to be able to tell their own positive fishing stories. 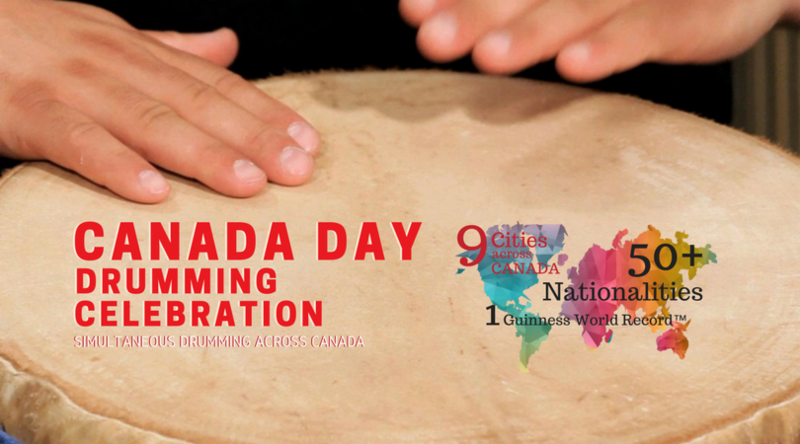 TIABC and the five regional destination management organizations (RDMOs) have signed an agreement for TIABC to provide secretariat functions for the RDMO Committee. 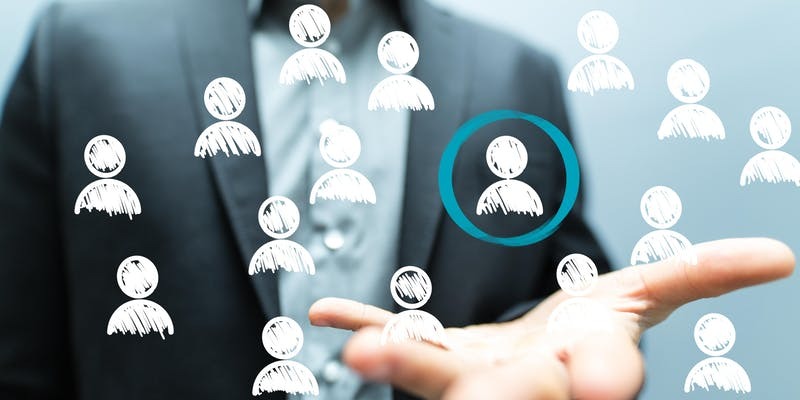 The secretariat role will include administrative RDMO meeting coordination, as well as providing opportunities for collaboration and learning with TIABC and other stakeholders. 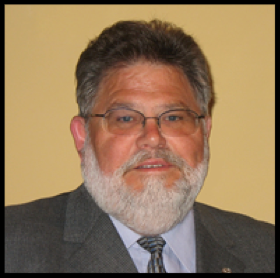 Glenn Mandziuk was elected chair of the committee for the inaugural year of this new exciting partnership. TIABC is pleased with this partnership with our RDMO members and looks forward to a strong working relationship withe the RDMO members. 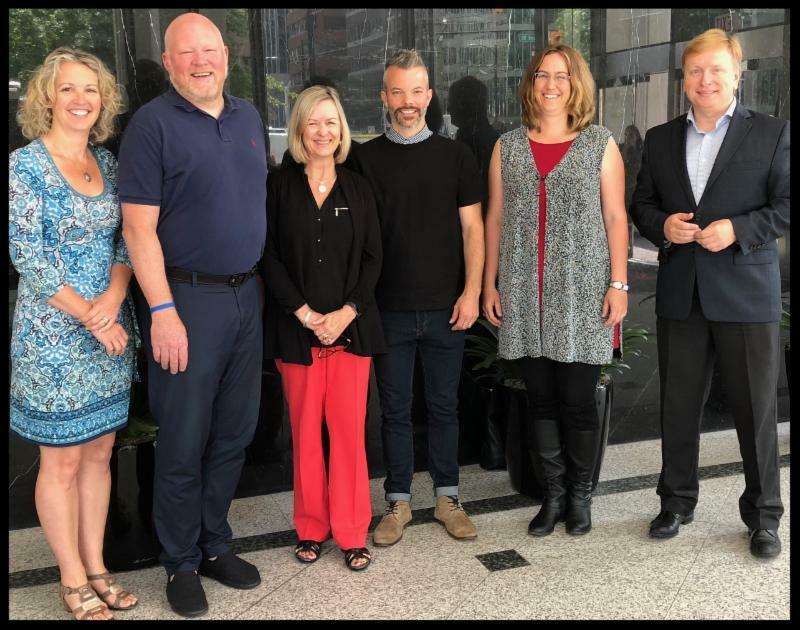 L to R: Laura Plant, TIABC; Anthony Everett, Tourism Vancouver Island; Kathy Cooper, Kootenay Rockies Tourism; Clint Fraser, Northern BC Tourism; Amy Thacker, Cariboo Chilcotin Coast Tourism; and Glenn Mandziuk, Thompson Okanagan Tourism. Early in 2017, Destination BC transferred WorldHost over to go2HR who are proud to take on the legacy of this program, and excited to let you know that they are launching a new suite of classroom and online courses under the revitalized, refreshed SuperHost brand. Tourism Vancouver launched their new city brand at their June 19th AGM. 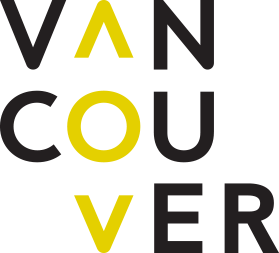 The Vancouver Destination Brand is the culmination of more than a year of research, strategy and design, in partnership with two of the world's top agencies, MMGY and McCann Canada. The Small Business Task Force invites your ideas on how to maintain a healthy small business environment, create good jobs and grow a sustainable economy for everyone. Under the direction of the Minister of Jobs, Trade and Technology (the Minister), the Task Force has been established to examine the opportunities and challenges facing small business owners in B.C. This online questionnaire is intended to capture ideas and feedback from British Columbians to inform the Task Force’s final report and recommendations to the Minister. Questionnaire closes June 29th. Please note: Small business in B.C. is defined as one with either fewer than 50 employees, or a business operated by a person who is self-employed without paid help. June 22, 2018 at 10:00 am. 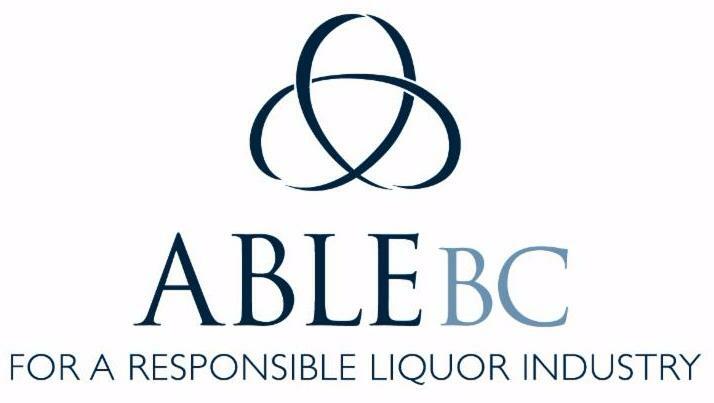 ABLE BC Executive Director Jeff Guignard sat on the Business Technical Advisory Panel , which was chaired by liquor policy advisor Mark Hicken and comprised of industry association stakeholders. The panel offered 24 recommendations that, if implemented, will have a lasting positive impact on BC's private liquor industry. Government has published the final report of the Business Technical Advisory Panel dealing with liquor policy. Although government has not yet committed to implementing the recommendations, today's announcement is an important first step. The project team is working fast and working hard to complete the building exterior. The roofing is complete, and much of the glass work and folding glass door has been installed with the remaining pieces set to be installed in the coming days. Throughout the project, environmental monitoring has been ongoing, with no issues to report. Inside the building, electrical, mechanical, and plumbing work continues. Soon, the shelving and display cabinets will be installed. The building is coming together nicely, and the entire Tourism Kelowna team is looking forward to welcoming and assisting visitors and residents at the new Kelowna Visitor Centre very soon. 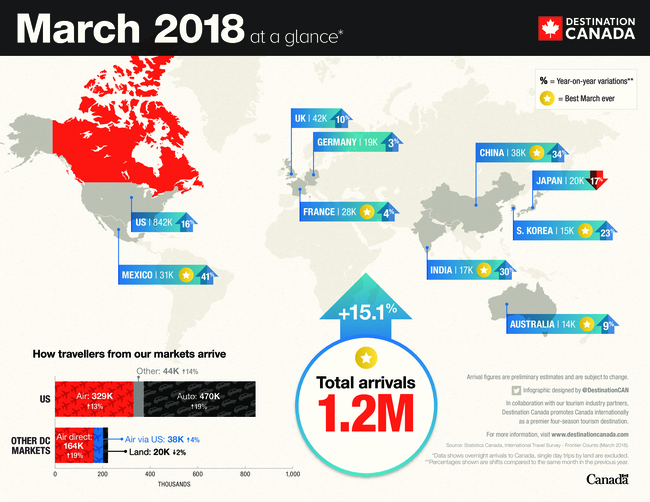 Tourism is a growing business in Kelowna and the Central Okanagan. In fact, the total economic output is over $1.25 billion. Visitor spending in our destination has increased from $279 million in 2011 to over $337 million in 2016. That's an increase of 20.8%. Between 2011 and 2016, spending on accommodations in Kelowna and area increased 12.3% and spending on activities and entertainment increased over 366.7%! 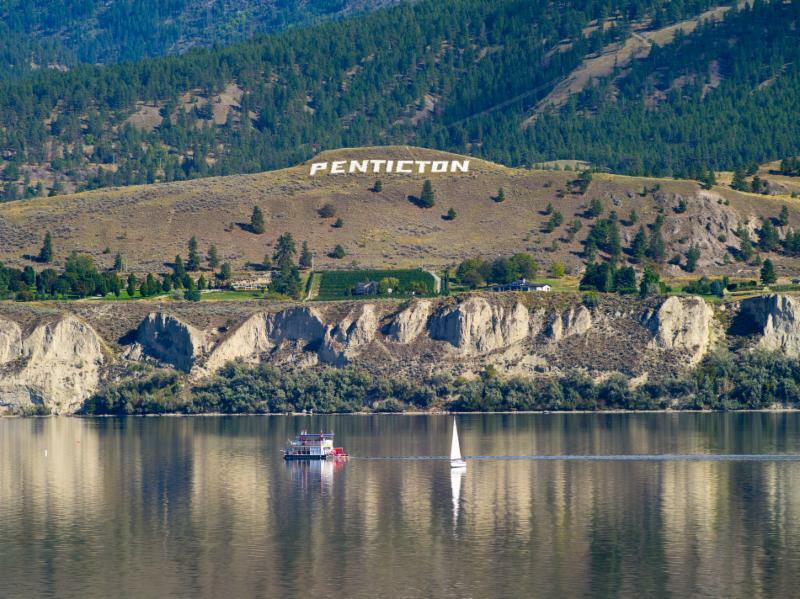 KVR Middle School students who are participating in the Travel Penticton Youth Influencers Program are getting directly involved in the "Chain of Events" tourism marketing campaign. Project Co-ordinator, Jo Charnock explains; 'The “Chain of Events” began a couple of years ago as a way to increase visitation in the shoulder seasons by promoting our region as a top class cycling destination, but we realized that by purely focusing on cycling we were missing other shoulder season travelers. We therefore developed a series of itineraries, highlighting unique visitor experiences, as a “Chain of Events” that are designed to appeal to specific traveler types - Athletes, Foodies, Families and Adventurers'. For the past several months. Travel Penticton has been working KVR Middle School students on a Youth Influencer Program, which involves, blog writing, social media, videography and design. The re-launch of "Chain of Events" presented an ideal opportunity to combine the two projects and get a youth perspective on what Penticton has to offer visitors. The students were tasked with writing blogs that would focus on either The Athlete, The Foodie, The Family or the Adventurer. Gold Country Communities Society is looking forward to welcoming an Executive Director to lead their enthusiastic Regional Marketing Team. Deadline for application is June 25, 2018. The Ministry of Environment and Climate Change Strategy has been given the mandate to develop stand-alone species at risk legislation, seek a better understanding of the challenges facing wildlife management and habitat conservation, and explore opportunities for developing more effective management tools. 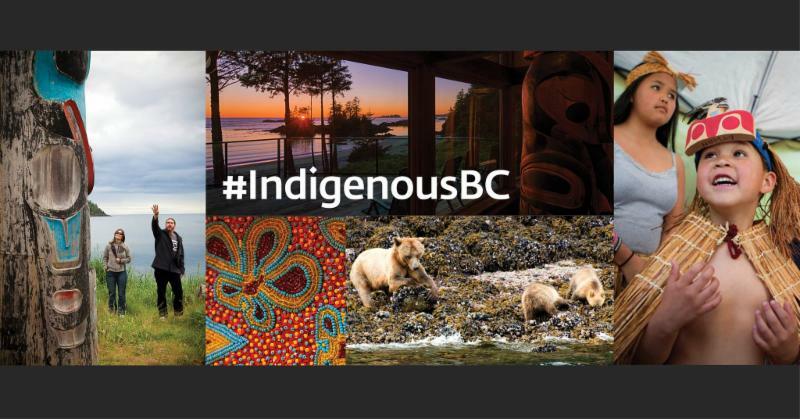 The purpose of this engagement is to open a discussion among Indigenous peoples, rural communities, wildlife organizations, natural resource development industry stakeholders, and the public so together we can identify ideas on ways to improve the way we manage wildlife and their habitat. 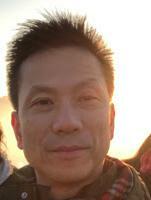 Eric Miller joins Tourism Richmond as a Strategist after developing a career in both market research and advertising. 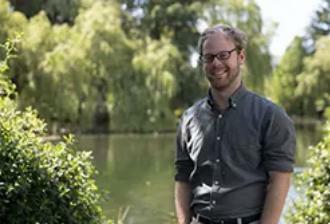 He studied marketing at the UBC Sauder School of Business, and now he couldn’t be more excited to use the analytical and marketing skills he’s developed over the course of his career and education, to help promote tourism in his hometown. WESTCOAST Sightseeing is pleased to announce renowned Executive Chef Ned Bell has joined their team as Chef Ambassador for Dinner in the Sky Canada , a unique elevated dining experience in Greater Vancouver this summer. From June 23 through July 29, Dinner in the Sky North Vancouver will be presenting fabulous brunch, lunch and dinner offerings from its scenic location at 415 West Esplanade, which showcases spectacular ocean, mountain and city vistas. Penticton Visitor Centre Team is getting out and about this Summer in their new Mobile Visitor Centre. 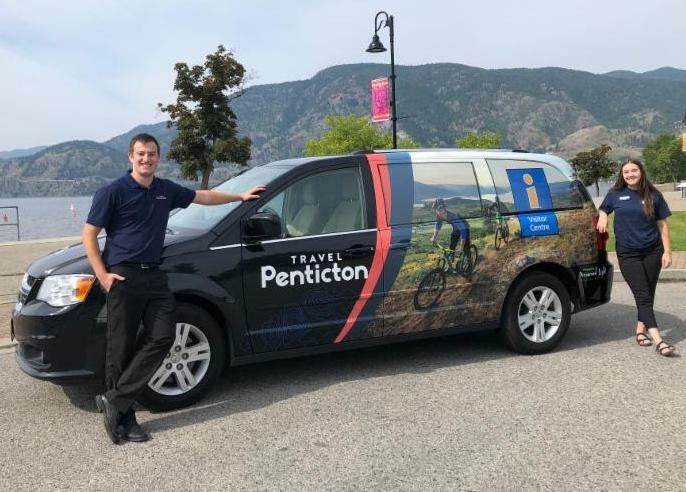 The Dodge Caravan is wrapped in eye-catching images of Penticton and will tour the city informing visitors about the area. On Wednesday, June 20, the first WestJet flight from Calgary (YYC) into the Canadian Rockies International Airport (YXC) landed just after 11am. The new regional air service is operating under a capacity purchase agreement (CPA) with Pacific Coastal Airlines. 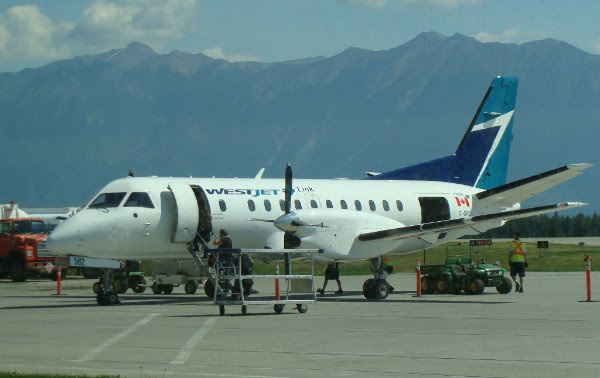 Using Pacific Coastal's 34-seat Saab 340B aircraft painted in WestJet colours, it will connect the region to WestJet's rapidly expanding network hub at the Calgary International Airport. Swoop took flight with a coast to coast launch including an early morning landing in Abbotsford on June 20. 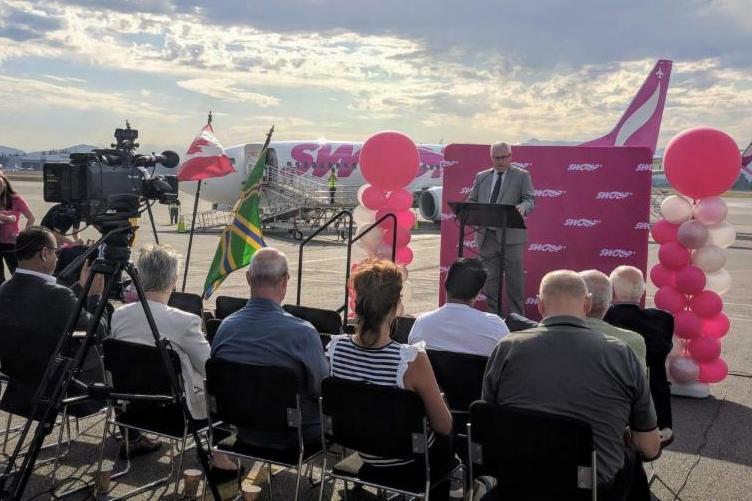 Initial one-way flights start at $49 tax included from Abbotsford to Winnipeg, $129 between Hamilton and Abbotsford and $99 between Hamilton and Halifax. Swoop is starting with two planes, with plans to roll out six by year-end and 10 in 2019. 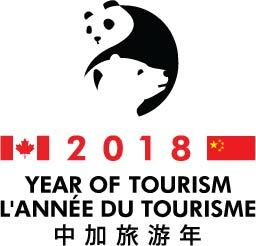 The Thompson Okanagan Tourism Association is pleased to announce their nomination for the North America’s Responsible Tourism Award! The World Travel Awards voting is now open with the deadline approaching in a few months. The World Travel Awards serve to acknowledge, reward and celebrate excellence across all sectors of the global travel and tourism industry. The headline reads: The Best Asian Food in North America? Try British Columbia and the article goes on to explain how Richmond has become a one-stop paradise for lovers of Asian food. 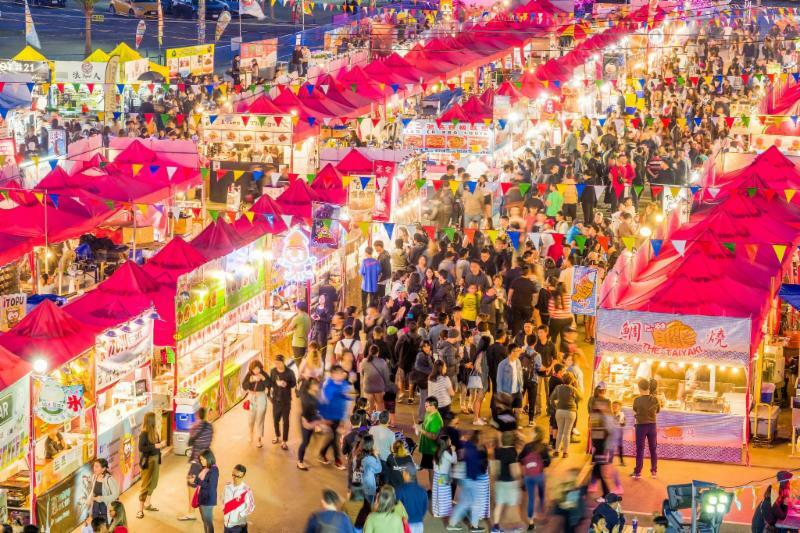 The Richmond Night Market, specific restaurants and cafes and food courts are all featured. To help Canadian companies take full advantage of the unprecedented opportunity offered by CCYT, the Honourable Bardish Chagger, Leader of the Government in the House of Commons and Minister of Small Business and Tourism, recently announced that she will lead a delegation of more than two dozen Canadian tourism companies, alongside provincial and territorial ministers and officials, to China from June 23 to 28.